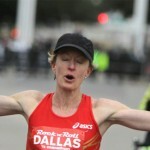 Along the way, Kastor also set three more Masters world records at 15K (49:03), 10 miles (52:41) and 20K (1:05:52). 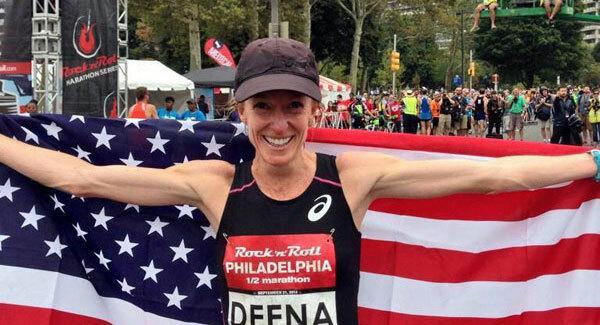 She also broke her own American Masters half-marathon record of 1:11:38. Her showing was a 20-second improvement over the previous world best set by Russia’s Irina Permitina in 2008. Ethiopia’s Aberu Kebede, the 2012 Berlin Marathon Champion, won the women’s race in 1:08:40. Kenya’s Caroline Rotich came in 41 seconds later at 1:09:21. Kastor said being able to keep an eye on both Kebede and Rotich throughout the race spurred her stay competitive during the miles where she had her doubts. 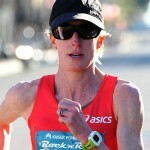 After the race, Kastor talked about the ups and downs she felt while she was competing on Sunday morning. “I had this annoying stitch in my side and wasn’t feeling great, but Michael McKeeman [the 2012 Philadelphia Marathon champion and a training partner of Kastor’s] who was running with me told me something that helped,” Kastor recalled. “He said, ‘You only have two more minutes to go, Deena. It’s just two minutes. You can do this.’ When I heard that, I thought about all the time I had put into training and realized that I can do anything in two minutes,” she said with a laugh. Next up, Kastor will run the New York City Marathon in November and hasn’t ruled out a shot at the 2016 Olympic team in the marathon. Karoki has been enjoying a solid year, setting personal bests on the tracks and roads. He said that if the conditions were better in Philadelphia, he would have taken down the course mark of 58:46 that belongs to Kenya’s Matthew Kisorio. “With a little more speedwork, I think I can run under 59 minutes,” he said. 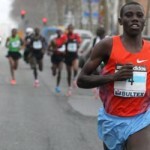 Kotut, who shared the lead with Kisorio and two other runners in the first half of the race, clocked 59:58 for second. Third place went to Geoffrey Bundi (1:01:25), who ran most of the race alone. The top American in Philadelphia was Gabe Proctor of Califorinia’s Mammoth Track Club. 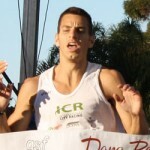 He finished ninth in 1:03:04. Approximately 20,000 runners lined up in front of Philadelphia’s storied Art Museum on Sunday under foggy skies. Temperatures for the half marathon were warmer than the inaugural 5K yesterday and humidity was measured at an unseasonal 89 percent at the start. Participants and spectators alike gathered at the finish at Eakins Oval for the post-race party that featured the band Rusted Root.